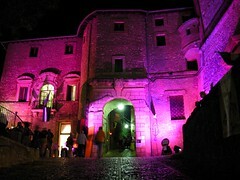 the first release of the software has been witten by Luca Martellucci for the Il Castello Sensibile. fluXsensi returns directions of motions, speed and an estimate amount of people at the door of the Castle of Contigliano, during the traditional re-enactment of the historic assault. The data was used to control the color of the light projectors.